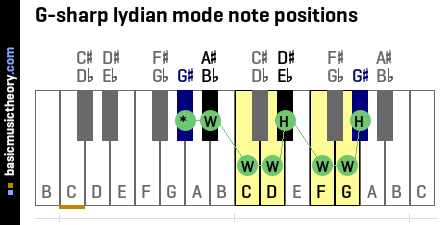 The Solution below shows the G-sharp lydian mode notes on the piano, treble clef and bass clef. This step shows the ascending G-sharp lydian mode on the piano, treble clef and bass clef. It also shows the scale degree chart for all 8 notes. The G-sharp lydian mode has 5 sharps, 2 double-sharps. This step shows the descending G-sharp lydian mode on the piano, treble clef and bass clef. 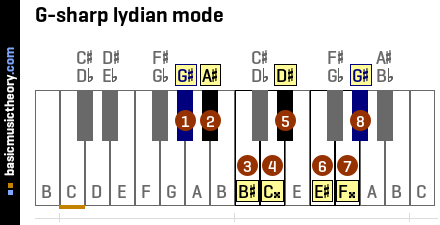 This step shows an octave of notes in the G-sharp lydian mode to identify the start and end notes of the mode. The G-sharp lydian mode starts on note G-sharp. This step applies the G-sharp lydian mode note positions to so that the correct piano keys and note pitches can be identified. 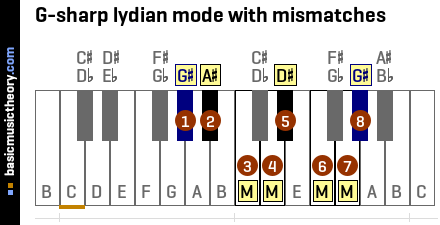 The G-sharp lydian mode re-uses this mode counting pattern, but starts from note G# instead. 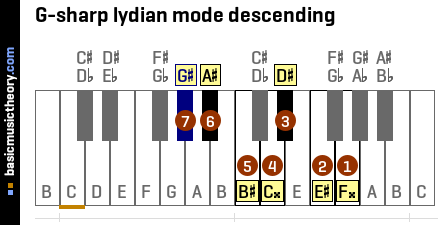 This step shows the notes when descending the G-sharp lydian mode, going from the highest note sound back to the starting note.